MailChimp has long been the go-to service for businesses on a budget. With up to 2,000 contacts and 12,000 e-mails sent per month, their Forever Free plan is nearly unrivalled in the industry. They’ve also got the most intuitive, user-friendly interface of the lot, having been designed with simplicity in mind. Even if you’ve never used an e-mail marketing service before, MailChimp’s learning curve is relatively accessible for a beginner. On top of that, they’ve got advanced marketing automation tools, superior third-party integrations, and A/B testing features. MailChimp is a leading marketing automation platform. You may have heard of MailChimp before, either by word of mouth, or you have spotted companies using their service. Either way, MailChimp can’t be ignored when it comes to your email marketing campaigns. 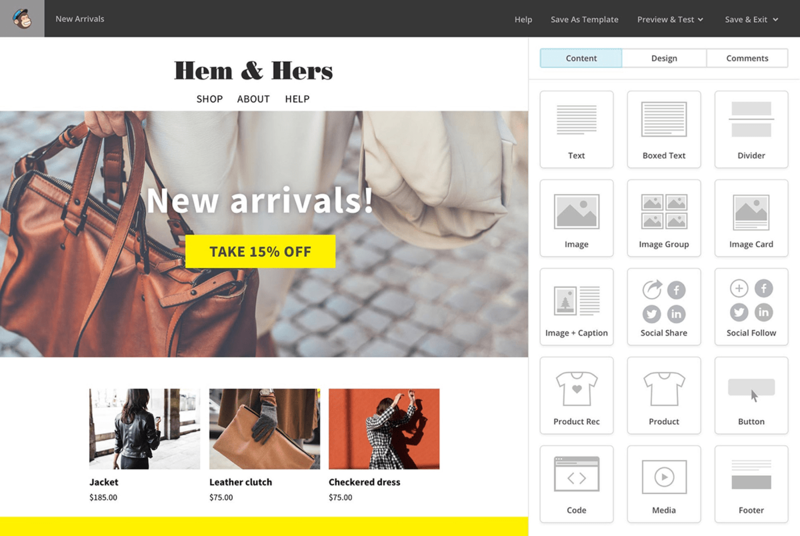 If you are on the hunt for professional looking templates, easy customization and loads of extra features, MailChimp is definitely your first port of call. Your signup forms and newsletters will catch the eye, reflect your brand image, and can be formatted for mobile and desktop devices in a snap. MailChimp sends more than a billion daily emails and has created products and personalized technology to help small businesses grow. 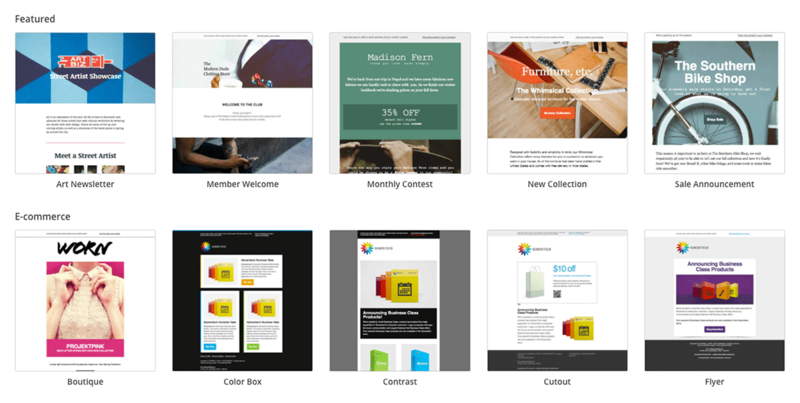 Take a closer look at the awesome features MailChimp has to offer. The options on offer are very exciting and user-friendly. Everything is intelligently conceived to make things so easy, even for inexperienced users. With intuitive design features, handy tools and beautifully designed templates for newsletters and emails, MailChimp definitely lives up to the expectation. Drag & drop your content right into the email – no upload or manual typing. Speed up workflow by styling the content blocks, save & apply to all similar blocks in the template. Drag & drop images to upload. Automatic formatting for Mobile devices – no expertise required. Check out how your email will look on desktop & mobile side-by-side. Template Selection: The templates are categorized into easy to find categories so you can find exactly what you’re looking for. There are hundreds of email templates and signup forms to choose from. Take a look around, see what catches your eye or your customers attention. The options are nearly endless and are all stunningly designed! Multimedia: MailChimp offers image and video hosting right on the site, or you can easily drag and drop photos in the template editor. See Why MailChimps Features are the Best! Free e-commerce features to sell your products and track your earnings, that seamlessly integrates with popular platforms like Magento, Shopify, WooCommerce, BigCommerce and more. Increase sales with customer segments, product references and promo codes. Drag and drop data- online store based recommendations that appear on each of your customer’s data allow you to customize automation to a personal level and stay competitive with tailor-made promo codes. Offer discounts and give your customers incentives to purchase, using a promo block to include your code in a campaign. MailChimp’s free automated emails include welcome messages, abandoned cart notifications, and order receipts, which save a ton of time and increase sales. MailChimp is incredibly easy to use and has intuitiveness in the forefront of design. Whether you need to create templates for newsletters or promotional emails, or want to navigate around the site to see what else you can get your hands on – MailChimp is simple as 1,2,3. No confusion, no hassle, no problems. You’ll enjoy playing around with all of MailChimp’s powerful features, and before you know it, you’ll become an email marketing pro. MailChimp did a great job with the FAQ, tutorial videos, learning center and forum section. When reviewing this section, we found that they had an easy to follow answer or solution to almost any question you can think of. However, there was no phone number to be found, which means you can only email or use the live chat feature to contact support, who will only answer during business hours. MailChimp offers 3 pricing plans, based on your needs, the size of your subscriber list and your sending frequency. The Forever Free, no- cost plan is perfect for beginners and includes powerful and useful features. Send up to 12,000 monthly emails and cultivate a list of up to 2000 subscribers. Forever Free offers almost all features included in the paid plans and allows you to experiment and build your mailing list and business for free (and forever). The Monthly Plan is ideal for frequent senders who cultivate a list of more than 2,000 subscribers or who’ve outgrown the Forever Free plan. It offers you an option to use paid features to enhance and engage your subscribers. The Monthly Plan comes with a set of exclusive features, like Inbox Preview and Timewarp. Pro Marketer Plan is tailored for enterprise-level marketers and is loaded with powerful features that will take your campaigns to the next level. Send your quarterly reports and newsletters or promotional event invites! You can send up to 12,000 emails per month, or pay-as-you-go when your list surpasses 2,000 subscribers. From start to finish – building your own email marketing campaign is so easy with mailchimp. Your choices are nearly endless in regards to the template selection, features and addons. For anyone starting out and looking to kick start their email marketing campaign, MailChimp is the one stop shop for email campaigns, with sign up forms, list integration, campaign tracking, and endless templates.